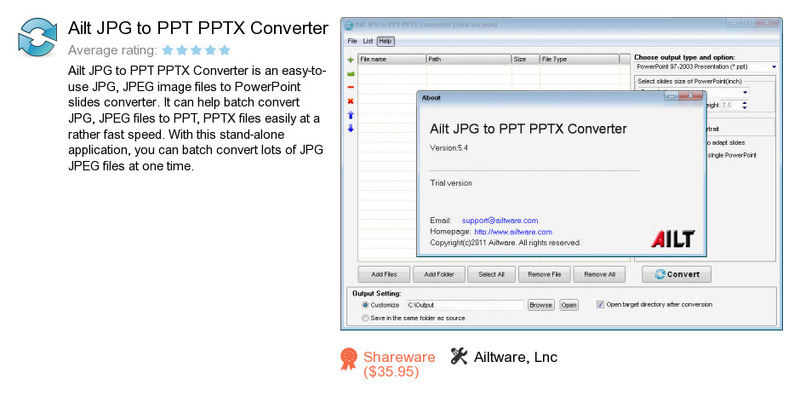 Ailt JPG to PPT PPTX Converter is an application developed by Ailtware, Lnc. We know of versions 6.7, 6.6, 6.5, 6.4, 6.1, 5.4. Version 6.7 is downloadable at our site. Ailt JPG to PPT PPTX Converter installation package has a size of 3,883,253 bytes. Ailtware, Lnc also publishes Ailt PDF to PowerPoint Converter and Ailt WMF to SWF Converter.